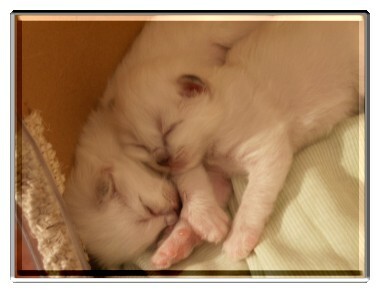 We have waited for so long these Babyes from Tabata, and she has make us wait until the 68th day, too!!. 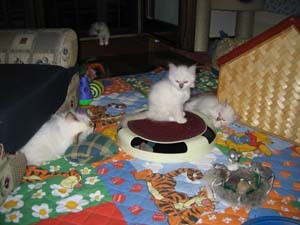 4 ENORMOUS babyes: the little one was 103 gr. and the biggest one 123gr. Shes a Proud and loving mom, but Cipria likes to go to Tabata's Babyes...so they're really funny!! 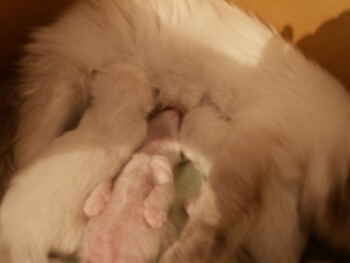 Tabata enjoys herself moving babys...but they only want to eat here or there!!! Golia 20 days old...so sweet. They's always tender...I have to have my camera always with me to not lost any special moment! Their GRANDSISTER doesn't knows she is not a baby, too!! The sad thing that I will never can't stand is the moment of leaving...the moment to let them go to their new family, but this time I'm glad to have found two special new parents like Elisa and Ale !! 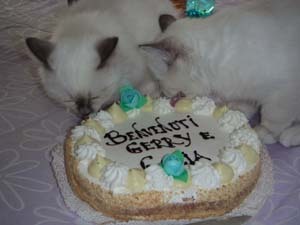 Here Gerry and Golia at their new home with thir welcome cake. They will all be loved! 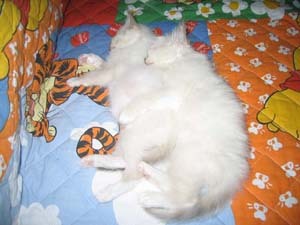 Galileo lives near me with two sweet humas ^_^ to stay in family! Gulliver will stay here with us! !